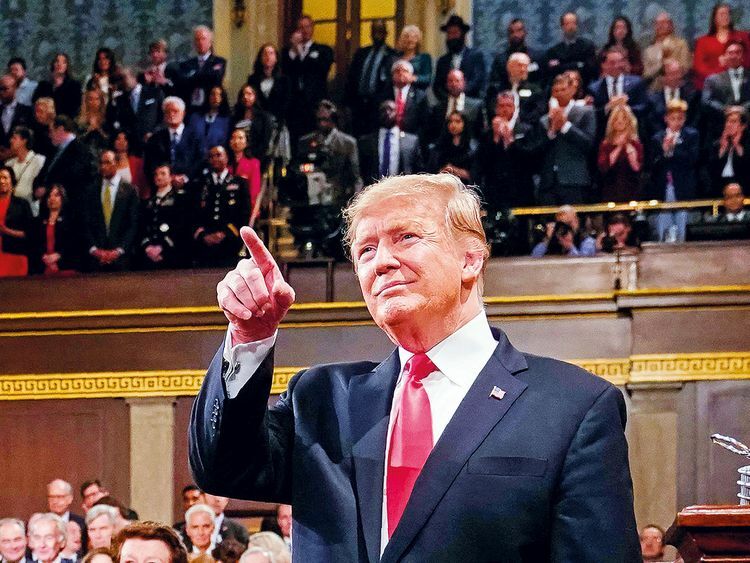 One night a year, during the State of the Union address, US President Donald Trump sets aside his affinity for combat to offer up 90 minutes of stand-up comity to a national audience. For more than a month, Trump has threatened to invoke a state of emergency along the southern border with Mexico in an attempt to circumvent Congress, which has refused to give him $5.7 billion for a border wall. But it was not until this week that Senate Republicans made it clear that diverting funding from other projects for a wall, in the name of a national emergency, was a nonstarter. For the moment, Trump heeded their wishes. The emergency declaration was not among his demands for increased border security. At the weekly Republican Senate lunch held in the Capitol held a few hours before Trump’s speech, Senator John Thune of South Dakota, the majority whip, was asked about the likelihood of the president’s invoking emergency powers. Thune said he believed the president would avoid a confrontation with his own party because too many Republicans opposed it. Then, about 15 minutes into the address, Trump hit on an issue foremost in his consciousness - the looming threat of congressional investigations into his conduct. First, he offered what amounted to a plea for the new Democratic majority in the House to avoid “ridiculous partisan investigations” and cautioned his enemies not to seek “revenge” against him. Then came the bluntest of threats to the woman sitting behind him, Speaker Nancy Pelosi: “If there is going to be peace and legislation, there cannot be war and investigation. It just doesn’t work that way!” he said. “We must be united at home to defeat our adversaries abroad,” he said. Already facing a divided Congress, Trump has been rebuked by members of his own party in recent days over his decision to pull troops from Syria and his demands for a border wall. In response, he invoked two issues that have been used to rally divided conservatives for decades - the fights against abortion and socialism. Trump dedicated several minutes to listing his economic accomplishments on behalf of women as he faced row upon row of seats occupied by Democratic women wearing white, in a visual demonstration of their unprecedented power in a House run by one of their own. “No one has benefited more from our thriving economy than women, who have filled 58 percent of the newly created jobs last year,” said Trump, who seemed genuinely surprised by the thunderous applause it evoked from women on both sides of the aisle. “You weren’t supposed to do that,” said the president, who went on to praise the record-breaking election of 117 women to Congress in 2018. That, too, garnered a hearty ovation. He has a long way to go, however. Recent polls show that large majorities of women disapprove of his performance. With Democrats now in charge of the House and amid a bitter border wall battle that led to the longest government shutdown in the nation’s history, the White House was bracing for a less-than-friendly reception from those gathered in the House. Instead, the 82-minute speech was punctuated by lighthearted moments, including when lawmakers from both parties sang a spontaneous rendition of “Happy Birthday” to Judah Samet, a member of the Tree of Life Synagogue in Pittsburgh who survived a shooting that killed 11 people in October. Trump joked that the lawmakers wouldn’t break into song for him. Trump made no reference to the 35-day government shutdown that rocked the nation’s capital, leaving hundreds of thousands of workers without pay and freezing many government services the first month of the year. It was a notable omission from a president who had once said that he would be proud to own the shutdown - and came just 10 days before the government is set to run out of money again. Trump did note that Congress “has 10 days left to pass a bill that will fund our government, protect our homeland, and secure our southern border.” But he didn’t mention the funding deadline.